If Hillary Clinton was disappointed in anyway about her razor thin margin of victory in Iowa last night she was not letting on. 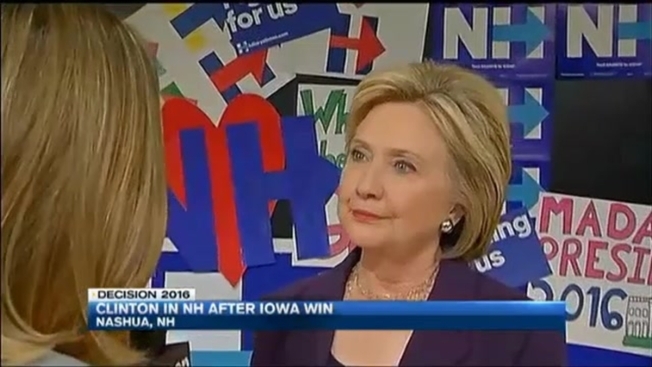 Clinton said, "A win is a win" and that she is thrilled to come in to New Hampshire as the winner in Iowa. In a one-on-one interview with Clinton, NECN asked if she, like Bernie Sanders, feels that America is in need of "political revolution." She said, "I think our political system is always in need of continuing progress, we are a progressive nation... I don't think we want to throw our country into a really contentious debate again about healthcare. I don't think we want to have the Republicans with so many unanswered questions." Asked about her emails, 22 of which contain top-secret information, not marked classified, according to the state department, Clinton said, "I just have to state the facts and the facts have been the same ever since this matter arose..."
Asked if she thinks there are aspects of our political system that are too politically correct, Clinton said, "well I don't think it's political correctness. I think it's insulting when a leading Republican candidate demeans and denigrates other people… I was taught to be polite, I was taught to treat people with respect." Asked if she could win in New Hampshire, Clinton said "well, I'm going to do everything I can to test that proposition..."
Clinton is being careful with the expectations game, knowing that a Monday poll had Bernie Sanders up by 30 points.